Making Being On Camera a little less stressful. Have you ever tried to speak on camera or even just into a microphone with people watching? It’s not easy. Burlington City Manager James Ridge was a natural on camera. It was our first time out with the new teleprompter. James was done only after a few takes. Email scripts to prompter@hillsvideo.com or download them to a USB stick. Scripts are uploaded to our computer ahead of time then the script is reviewed. 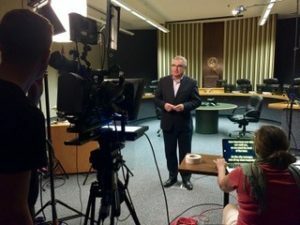 Spacing, breaks and prompter short cuts are edited to allow for natural pauses for the presenter and if needed the shortcuts allow for easy pickups. Almost all scripts require last minute changes and that’s why Hill’s can help you save time. You can make changes on the fly then give it a practice read, and then deliver to camera without fumbling your words. Hey, and if you do, no problem, it’s digital, pick up and try again.